Only member of the genus Volatinia, the Blue-black Grassquit performs a stunning jump display, giving the bird its local name “Johnny Jump-up”. 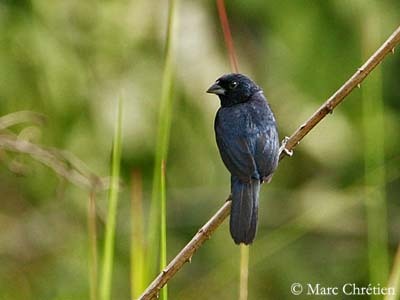 Adult male has glossy blue-black plumage overall. When in flight, we can see a white spot at the bend of the wing. We can also see whitish axillary spots on the underwings. The head is glossy blue-black too. The pointed bill is short and conical, with blackish upper mandible, and greyish lower mandible. The eyes are dark brown. Legs and feet are black. 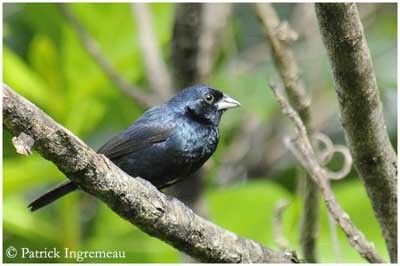 Blue-black Grassquit is common and even abundant in suitable habitat. This species is not threatened at this moment. 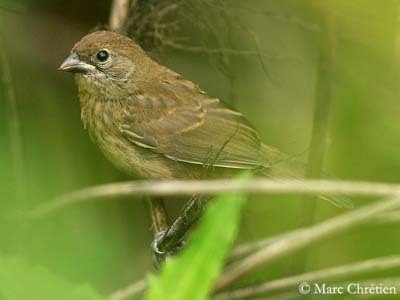 Adult female has olive-brown upperparts, with darker brown plumage and tail. The underparts are buffy-white, with streaked dark brown chest and body sides. Belly and vent are whitish. On the olive-brown head, we can see a whitish eye-ring. Immature resembles female, but young male is darker. It reaches its adult plumage at about one year old. Blue-black Grassquit sings from a perch. It utters persistent wheezy, buzzy “duezz-uu”, usually while it performs short vertical jumps with fanned tail. Call is a sharp, high-pitched, slightly liquid “tsick” or “sip”. Blue-black Grassquit frequents grassy clearings, weedy pastures, open places such as cultivated areas and gardens. It can be seen at forest edges. It is visible up to 2200 metres of elevation. 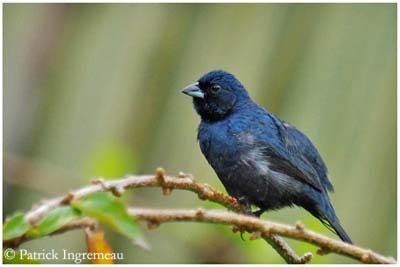 Blue-black Grassquit is found in Central America from Mexico, southwards through Brazil to northern Chile and Argentina. Blue-black Grassquit feeds mainly on seeds and small insects. 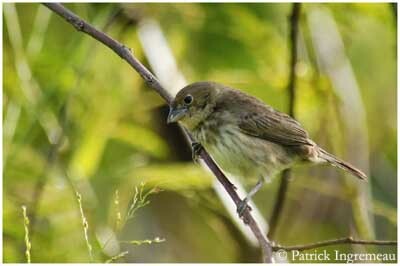 It is usually seen alone or in pairs, sometimes in loose flocks at food sources. During breeding season, the male performs spectacular displays related to pair formation. Several males gather at the same place, similar to a traditional lek, and perform conspicuous displays. Each male has different displaying rate and defends its small territory. 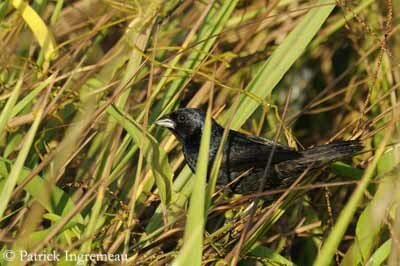 However, the Blue-black Grassquit is not included into traditional lek mating behaviour. This species seems to be monogamous. The courtship display consists of several repeated vertical jumps at about 50 to 90 cm high or more, from a perch. These short flights allow the male to display the white axillary spots on the underwings while it utters its short buzzy song. It descends head first, and repeats this display every few seconds. Blue-black Grassquit male performs spectacular flight displays during breeding season. When in flight, the bird exposes the white wing patches. Breeding season probably occurs from May-June to late August. The nest is cup-shaped and made with stiff plant fibres at the bottom, and marsh grasses. It is often built among clumps of grass or low in shrubs. This nest is very rigid and built in loose manner. It is usually unlined. Female lays 2 to 3 greenish or bluish-white eggs, with brown markings. Incubation lasts probably about 12 to 13 days, mainly by female, but the male replaces her when she forages for food. Both parents feed the young. The nesting period seems to be relatively short, about 9 to 10 days. This species uses the same nest-site or territory for several years. Blue-black Grassquit feeds mainly on seeds, often of the tall grasses on roadsides, or in open woodlands. It also consumes small insects. The male still performs this “dance” during the incubation period. It is perched on exposed place, and it jumps straight up from this perch, uttering its sharp, buzzy song. 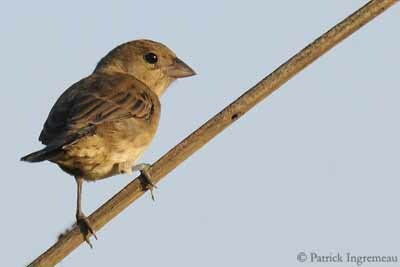 It makes a brief turn in the air at about 50 to 90 cm high, and drops back to the original perch. It repeats this display several times, at varying intervals. When the chicks hatch, the male ceases its displays and feed the young. 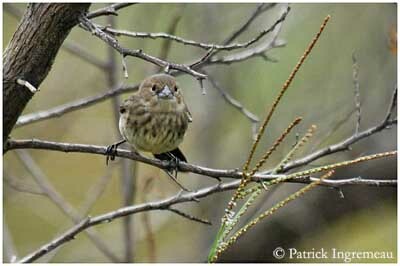 The blue-black Grassquit is sedentary in its range, but it may perform some seasonal movements outside breeding season.